A point-per-game player last season, Dewar has taken a big step forward in his fourth WHL season. He’s up to 1.65 points per game on the year, and ranks fourth in the league with 16 goals in 17 games. Dewar had a pair of goals in Everett’s 5-1 win over Seattle on Saturday, then added a goal and an assist in a 5-2 win over Kamloops on Sunday. He was back at it Wednesday, adding another goal and assist in a 3-2 win over Portland. Dewar has at least a point in his last 11 game, and has been held off the score sheet just once this season. The Wild had to wait a while to address their offense in this year’s draft after taking a defenseman in the first and trading their second-round pick, but the last of their three third-round picks could wind up providing some major value. A week after earning his first AHL shutout, Kahkonen already has his second. Kahkonen made 20 saves to help Iowa to a 3-0 win over Milwaukee on Wednesday, picking up his second straight shutout in his fourth AHL start. Officially, Kahkonen is the backup to Wild goaltender Andrew Hammond, but the 22-year-old has now allowed just one goal in three games since giving up three in his first appearance, and leads the AHL with a 0.99 goals-against average and a .962 save percentage. Shepard is back at it a year after helping UMD to a national championship. The junior shook off a six-goal outing against Minnesota during the first weekend of the season, and hasn’t allowed more than two goals in a game since. He was nearly flawless in a two-game sweep of conference foe Colorado College over the weekend, turning in a 19-save shutout Friday and making 15 saves in a 5-1 win Saturday. Shepard has a 1.84 goals-against average and a .916 save percentage through 10 games, but has had a .927 save percentage since that loss the Gophers. 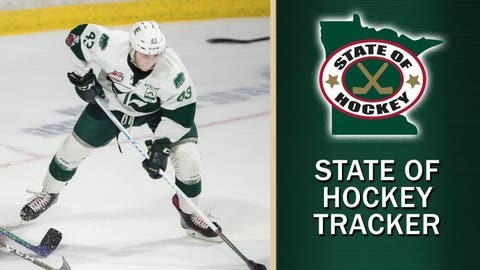 A native of Cohasset, Minn., Shepard went undrafted, but attended the Wild and Buffalo Sabres’ development camps over the summer. — Shepard has had plenty of help this season. UMD’s defensive corps is among the nation’s best, and junior Nick Wolff led the way against CC, racking up a goal and three assists in the sweep en route to NCHC Defenseman of the Week honors. — Wild prospect and UMD sophomore Nick Swaney was a factor in that series as well, scoring twice on Saturday for his first multi-goal game since joining the Bulldogs. — St. Cloud State freshman Nolan Walker was also honored by the NCHC after helping the Huskies to a win over Denver on Friday. He helped erase a two-goal deficit, registering three points to power SCSU to a 4-3 win. — A point-per-game player in the high-scoring WHL, Wild prospect Mason Shaw’s AHL career is off to a solid start. A fourth-round pick in 2017, Shaw has 10 points in 14 games for Iowa, second on the team to career AHLer Cal O’Reilly. — Dmitry Sokolov is finally on the board in his first full AHL season. The Russian winger scored his first two goals of the season in Iowa’s 4-3 loss to Bakersfield on Saturday, snapping a seven-game scoring drought. A seventh-round pick in 2016, Sokolov spent three seasons lighting up the OHL, scoring 128 goals in 196 games. — Forward Sam Anas, who led Iowa with 26 goals last season, has found his scoring touch again. The third-year pro was held without a goal through his first 10 games, but scored in three straight games for his first goals of the season. Signed as an undrafted free agent out of Quinnipiac in 2016, Anas set franchise records last season, with a 10-game point streak and six-game goal streak, and is looking to earn his first look with the big club this season.